Do you know the Single Responsibility Principle (SRP)? The single responsibility principle is a computer programming principle that states that every module or class should have responsibility over a single part of the functionality provided by the software, and that responsibility should be entirely encapsulated by the class. A Definition that "Works for Me"
So, some of the confusion comes from “single responsibility” vs. “single reason to change”. The definition that talks about “responsibilities” is hard to follow in practice: What exactly is a responsibility? What if I can divide the responsibility in multiple sub-responsibilities? How can I make sure that all the code is part of the same responsibility? On the other hand, “one reason to change” sounds more like a heuristic to me than a real definition. Yes, when a class has many different responsibilities, it also has many reasons to change. But if that was the definition, we should rename the principle to “SRTCP” (Single Reason To Change Principle). You can describe everything a design element (method, class, module, ...) does - at a reasonable level of abstraction - as a single, coherent thing. In other words, if you use “CRC cards” to desing your classes, the “Responsibilities” column should contain a single bullet point. If the level of abstraction is too high, you can describe everything as a single thing (“Is a part of the XYZ system”). If the level of abstraction is too low, everything has many responsibilities (“Execute assembler instruction x. Execute assembler instruction y. …”). So what is a “reasonable” level of abstraction? When I teach TDD workshops, I ask the attendees to implement Hangman (the word guessing game) - even multiple times. I now want to discuss with you a few possible designs for implementing this game (none of them is the best possible design, of course). This design has a few disadvantages. Most glaringly, in a TDD class: It is really hard to test. Especially if you do not make any compromises like making methods public that should actually be private. 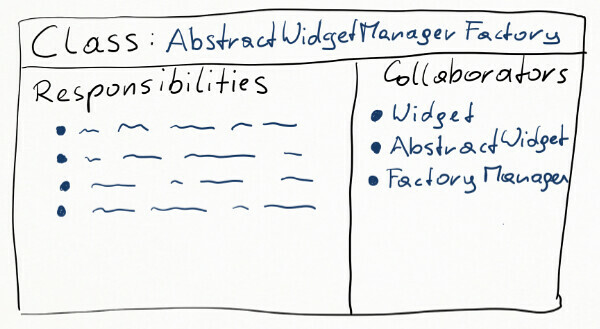 So, how do you decide which level of abstraction is right? To add clarity to your design, make sure that all design elements in a level are roughly on the same level of abstraction (yes, there is gut-feeling involved in deciding that). So, all the public methods in a class should be roughly on the same level of abstraction, and the class itself would be on a higher level. They delegate to private methods of that class to do the real work, which are on a lower level. Sometimes you can find interesting responsibilities by looking at the tests of a class or method. And when you split it, you might need new design elements (a new package or a new class) to keep everything at roughly the same level of abstraction. 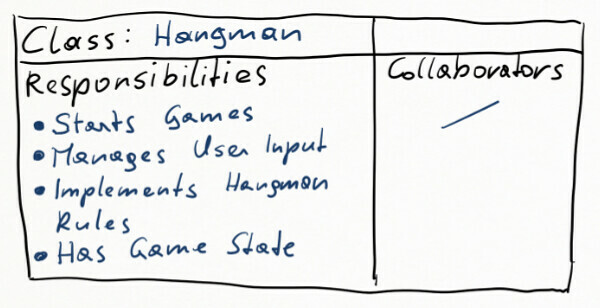 Hangman - Implements the flow of a single Hangman game, given a secret word. √ updates hint to "c____" after guessing "c" when word is "cases"
√ updates hint to "c_s_s" after guessing "c,s" when word is "cases"
√ updates hint to "c_ses" after guessing "c,s,e" when word is "cases"
It seems like this class has three different responsibilities (at least at some level of abstraction). So, if I wanted, I could split this “Rules” class even further, into one class for each of the groups, and one to coordinate them. Then I would probably need a package to group these two “Rules” classes, and the responsibility of that package could now be “Implements the state changes of a single game, based on the rules”. The Single Responsibility Principle gives you an indicator when to change your design. Split your methods / classes / modules when they have more than one responsibility. 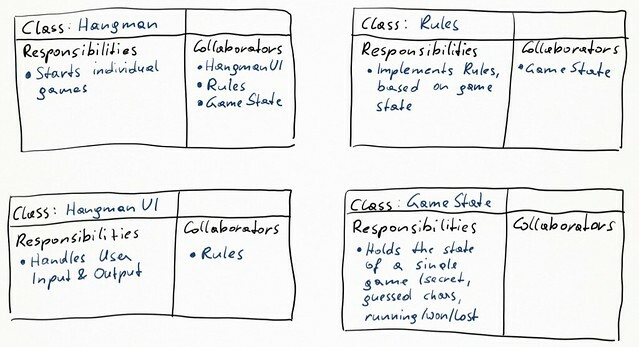 Restructure code when your classes / methods / modules do not fully encapsulate that responsibility. When your design elements have many different responsibilities, they have many reasons to change. And they are also hard to test. When your design elements do not reasonably encapsulate their responsibility, changes will cascade through your code. And again, it will be harder to test. But do not start to split all your classes alon their reponsibilities right away! The SRP should not be the only driving force of your designs - There are other forces, and sometimes they give you conflicting advice. Take, for example, the SOLID principles - 5 design principles, where the SRP is only one of them. By the way: Jon Reid has now also written an article about the SRP: Single Responsibility Principle: Is It a Fundamental Mistake? Go read it, it’s excellent!